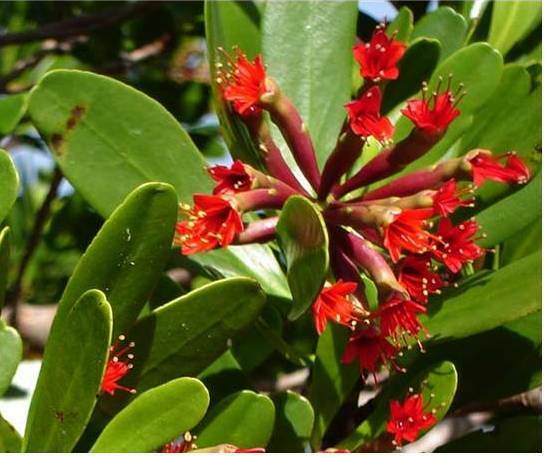 • Grows as a shrub at 2m but also known to spread out and reach a height of 9m. • Leaves are narrow at the base then extend into an oval shape reaching a length of 8-9cm. • Flowers small (2-3cm) in dense bunches, bright red with five tiny petals (the stamens are much longer than the petals). The flowers are fragrant and produce lots of nectar. This species appears to be predominantly pollinated by birds, especially sunbirds and honey eaters, with bees and wasps as additional visitors..
• Fruits are green before turning to brown. Uses: the timber is hard and durable, and thus sought after for marine pilings as well as bridges, wharves, parts of canoes and other household items. There are reports that pier posts made of the tree were still sound after 20-50 years. When first cut it smells of roses. But large-sized timber is rare. It is also used as firewood.. Leaves said to have medicinal value. Habitat: in the drier part or directly behind mangrove swamps. Distribution: Ranges from Asia to the Pacific through Australia.